For the first time in a very long while, I saw the old-style notification banner! For quite some time, I've seen more discreet notifications of new answers, appearing within the page itself, just above where I compose my answer. This harkens back to many months ago. Is this intended behavior, or a bug? 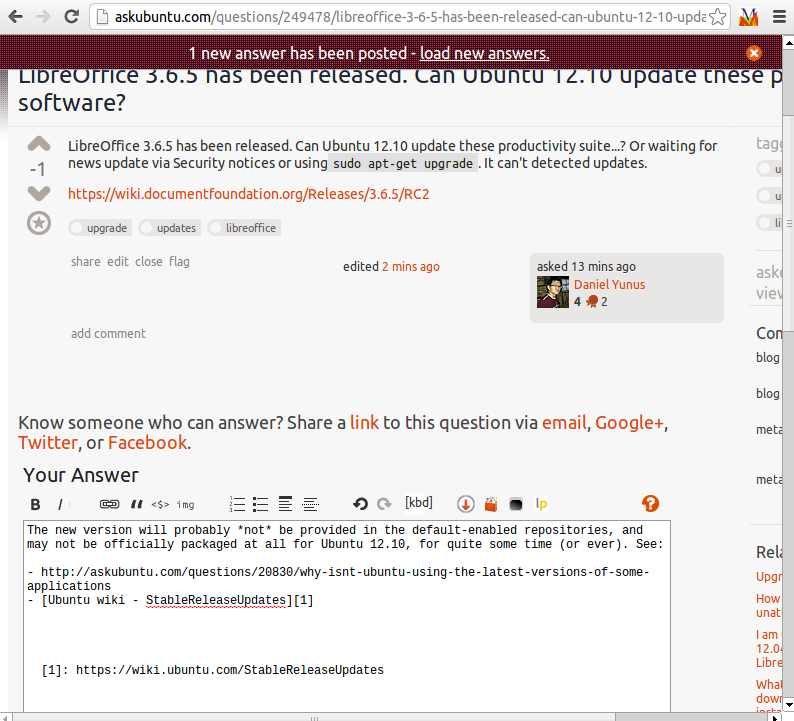 If it is intended, does this always happen for notifying users of new answers while they're composing their answer? Does it happen for other situations also? Or is this intended but not normal (e.g., reflecting a problem with my browser, causing Stack Exchange to fall back on an older way of doing things). New-style notifications still seem to still work fine (for things like comment and chat pings, edits on my posts, and badges). In case it's relevant, I'm using Chromium, which reports its version as 23.0.1271.97 Ubuntu 11.10 (23.0.1271.97-0ubuntu0.11.10.1). It appears they are still around under certain circumstances. I ran into one myself while editing a question. Not exactly the same thing you had but similar. Or perhaps because the older notifications are longer and provide more information. I've seen this several times since I posted this, but forgot to mention it here. I have a feeling these are supposed to be here, because once when I was using a test account it asked me to add a password, and kept asking me, so I don't think this is a bug necessarily..
Not the answer you're looking for? Browse other questions tagged support user-interface notifications answered-questions .